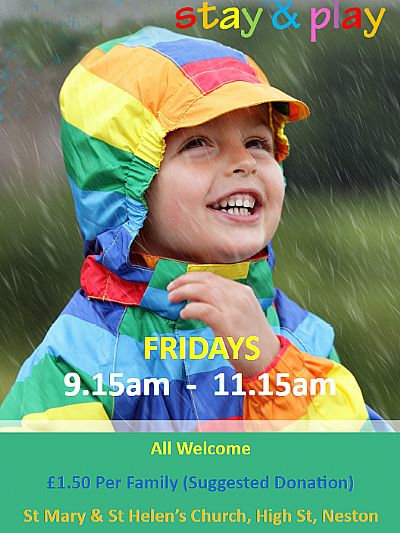 Every Friday morning between 9.15 and 11.15am there is a warm welcome in the West End of our Parish Church for young families. They enjoy playing, chatting, doing craft work and singing songs. Tea, coffee and toast and jam are also much enjoyed – especially if Mums have come straight from the school drop off! Many new friendships have been made and the Get together provides an opportunity to share experiences, problems and joys. One Mum said how nice it was to come into such a beautiful Church. Many other groups meet in rather bland halls so to come to such a warm and interesting building with its historic yet timeless atmosphere was a great bonus. Hannah, Mandy and Anna are to be congratulated on starting this invaluable service to our community. And grateful thanks also to the ladies who help each week with the refreshments. Stay and Play is about Caring and Sharing. As we seek to share his love, we pray that God will continue to bless all our children and young families and enable us to care for each other.